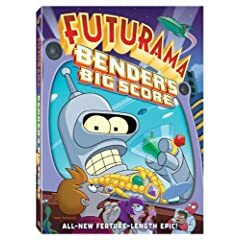 The new Futurama film, Bender's Big Score is the week's DVD release highlight for me. Featuring all new material, this film is the first of four the series' creators will release. Among television series releases, the complete O.C. series is out this week as are the third seasons of Happy Days, Laverne & Shirley, and Mork & Mindy. Literature fans can check out the film adaptation of Jhumpa Lahiri's The Namesake. Performances by two classic female singers make up the most interesting music video releases, the Judy Garland Christmas Show and Dusty Springfield: Live at the BBC.